SmokingCrayolas' entry in the Video Association of Dallas' 112h Annual 24-Hour Video Race. 2013 saw the complete return of the usual suspects and a couple new faces. Barry and Mike, of Brand-O fame, were poor beggars looking for a home, and seeing as we've been rooting for each other at the finish line and screenings for several years, we went ahead and let them in. And we couldn't be happier about it. Dialogue: "Ask not what your country can do for you - ask what you can do for your country." As we walked out of the Angelika, we were all a bit non-plussed. For the first time ever, the Theme felt like a re-hash, and not of a long-ago theme, but 2011's "going green." The Location, while thankfully plentiful across Dallas proper - allowing for few run-ins with other teams - it also felt far to specific a location for teams stationed in the greater metroplex to use. I felt particularly bad for all the teams stationed in Fort Worth. Lastly, the Dialogue was long enough to be cumbersome and far too famous. Very few teams (SmokingCrayolas not amongst them) inserted it with ?lan. In the vast majority of films I saw, it was completely shoehorned. That being said, I think we did a pretty good job. After brainstorming various types of cycles (including menstrual!) someone finally mentioned Hollywood's tendency to rehash and retread every damn concept, often optioning a picture just because it's similar to something a competing studio has in development. We made it a pitch, and we were off. The revelation here was Barry's artistic abilities. While Kirk and I had a blast playing with markers and did a good job, Barry just kept churning out great piece after great piece. There's a phone-book head Marsellus Wallace that's just awesome. While Barry, Kirk, and I sat around Todd's kitchen table, drawing, chatting, laughing, animating and editing, Niki, Jake, Erik and Todd were taking care of principal photography, pick-up shots, and our audio needs. Barry later said they were the LucasFilm to our ILM, which I find apt. The whole team worked exceedingly well together, the new additions blending right in and contributing beautifully to the finished product. I very much look forward to working with these guys again, and I can't wait to see what the future holds for us. 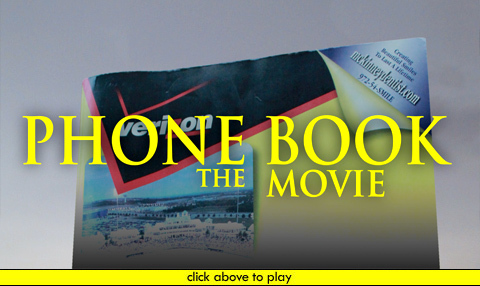 Update 05/20/13: "Phone Book: The Movie" took third place in the Hollywood division.